AddFreeStats Analytics provides advanced web statistics tool that is best suited for your Joomla website. With AddFreeStats you will get information about visitor activity: How many people visit your Joomla site, what they do (pages viewed, time spent), how they found your pages and how they leave your website. Easy to use and install, AddFreeStats Analytics is one of the best tools available for your Joomla website. AddFreeStats tracking code is loaded in an asynchronous manner. This new technology improves website page load performance. Below is a step by step procedure of how you can install the Addfreestats tool into your Joomla site. 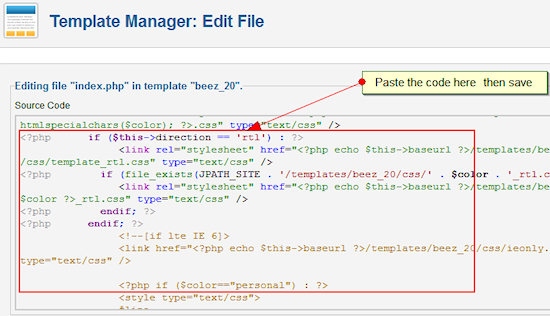 2) Secondly you need to log into your Joomla site panel and click on the "Template Manager". 3) Next you need to take note of the default template and not to be confused with the administrator. The default template is usually denoted by a star. Next click on the "Templates tab". Please note that if the template in use at the time of installation is changed, you also need to start the installation of the Addfreestats tool in your site as a fresh. 4) After clicking on the "Templates tab", scroll down to the default template and click on it. 5) Next you need to click on "Edit Main page template" and then scroll down to the description box to paste the Addfreestats code just before the end of the closing body tags "</body>". 6) Finalize the installation by clicking on "Save" and the tool goes live. Your Addfreestats tool will now start recording analysis and you can view them by accessing the button placed on the site or by logging into your AddFreeStats Analytics account where you get detailed analysis and also get to change several options and settings. The tracking code will work well, provided the template of the website is not changed or altered in a way that changes the Addfreestats code. In case a new template is installed, a fresh install of the AddFreeStats tracking code is recommended. Addfreestats provides an easy to use platform that serves and presents lots of detailed analysis that beats the rest in the industry. Signing up for an account is easy and takes just a few minutes.